Sometimes, the basics can be really helpful. Lots of people have asked me how to prepare good rice. A pantry staple, rice can befuddle people as it to often turns out gummy when it should be light and fluffy. Usually, all it takes is a little technique tweaking to end up with the perfect pot of rice, whether white or brown, short grain or long. I have been meaning to offer a “Rice 101” for a while now, sort of like the versions I have done for quinoa and millet. All the guys in my family adore a heaping plateful of rice, ideally with a little soy sauce sprinkled on top. In fact, my husband considers this the perfect lunch. So simple but so good. After a virulent stomach virus recently passed through our family, I had no reason not to finally share my easy how-to. After all, the boys barely ate a thing for three full days and, when they were finally ready to consume something solid, rice was the only thing that appealed. I cooked a lot of rice. So, whether you are cooking rice as one of the “BRAT” sickness staples (I recently had to explain this to my brother–“BRAT” is an acronym for bananas, rice, applesauce, and toast–all of which are easy on the GI tract), or simply want a perfectly prepared side dish or base for your favorite Asian or Mexican meal, the following technique should set you on the path to perfectly prepared grains. Additionally, I am excited to announce that, in an effort to offer a helpful, new feature here at The Fountain Avenue Kitchen, I have partnered with ZipList. Now you can easily view all of your saved recipes in one convenient location – your very own personalized recipe box! This feature also allows you to save recipes from other sources, use a weekly meal planner, and access a multitude of grocery deals. If you have not yet noticed, there is now a “Recipe Box” feature on the menu bar at the top of the page as well as a “Save Recipe” option beside the print option. These features allow you to keep all of your favorite recipes in one place. For those who may be interested, there is even a recipe clipper button that you can install on your own toolbar to make it even easier to save recipes that you love. With ZipList, you can easily drag saved recipes from your recipe box right into your weekly meal planner. If your family really enjoyed certain recipes in previous weeks, you can add them to your regular weekly rotation. With a single click, you can add ingredients to a shopping list, whether from a single recipe or your entire week’s menu. You can even use previously saved weeks as a template and exclude items that you already have on hand. Once your list is done, you can print it or access it through your phone by text or email. There is even a free app which has countless additional features. The hope is that this feature may be a helpful way for some of you to save recipes and organize your grocery list, making the nightly task of cooking a bit easier. As a side note, there will be an occasional recipe that does not display the “Save Recipe” button. To make this system functional, I must reformat the several hundred recipes on this site. I’ve worked my way through most of them, but not all! Although most instructions for cooking rice use a ratio of one cup of rice to two cups of water, I prefer a little less liquid. “Starving” the grains, as I like to say, prevents overcooked, sticky rice. 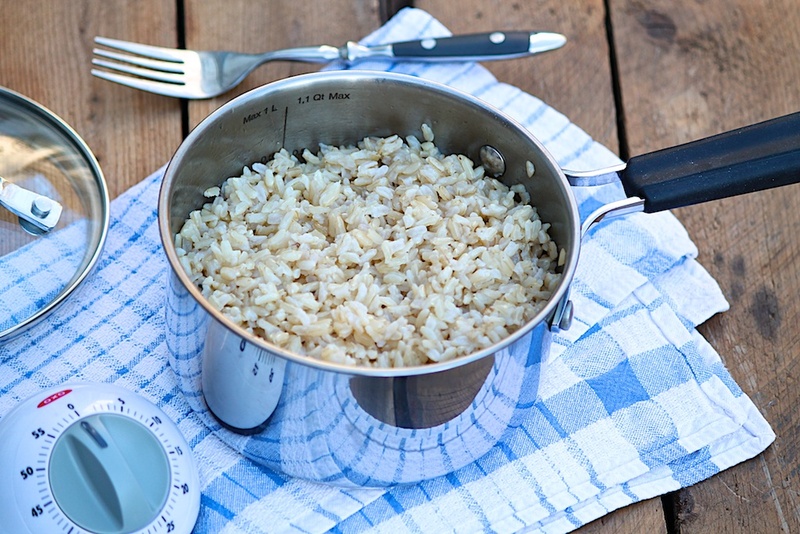 Bring the water to boil in a pot with a tight-fitting lid. Rice expands as it cooks, so the rice will cook better if it has sufficient room. A 2-quart saucepan is what I typically use. Once the water boils, stir in the rice, salt, and butter or oil. Cover the pot and turn the heat down to low. You want the liquid to just barely simmer. Don’t remove the lid while the rice is cooking (until the very end when you do need to peek). Start checking the rice around 15 minutes for white rice and 30 minutes for brown rice. When done, the rice will be firm but tender. It’s fine if the rice is slightly sticky, but it shouldn’t be gummy. If the rice is done but there is still a bit of water in the pan, carefully pour it off. Cooked rice will keep well in the refrigerator for several days, so you can prepare it in advance and reheat or make extra for leftovers. Cooked and refrigerated rice is also perfect for making fried rice. Measure a quarter cup of uncooked rice per person, or a half cup per person for more generous servings. One cup of uncooked rice will yield approximately 3 cups cooked. You can double the recipe, but I do find that the deeper the rice is in the pot, the more difficult it is to cook perfectly. You may find subtle differences among cooking times of short, medium and long grain varieties. However, if you follow the basic directions, checking a little early and so on, you should have perfectly cooked rice no matter which variety you choose. Cooked rice “freezes beautifully” (one of my favorite movie quotes), too. I live alone, so I cook up a batch, portion into small baggies when the rice cools off, freeze flat (saves space and thaws faster), and I have rice available for several quick meals. Great point and tips, Violet. Thank you for taking the time to mention this…and now I am wondering from which movie that quote came! Baking rice also yields great results. It takes a little longer, but if I have the oven on for meal preparation anyway, I always bake the rice, too. I think brown rice turns out especially good this way. It’s also a nice way to prepare rice in large quantities. I totally agree! I have a baked brown rice recipe that I have used for several cooking classes and will share it one of these days, too. Thanks for the good reminder! Thank you. Some times the basics get overlooked fur us beginners.